At the age of fourteen, Liang May Seen was sold to a brothel in San Francisco. How did she become a Minnesota pioneer? Liang May Seen (1871-1946) was born in China to an impoverished family. When she was fourteen, her parents sold her to a man who promised she would be married to a wealthy Chinese American businessman. Instead, she was sold to a brothel in San Francisco. After three years of servitude, she planned her escape. In 1889, Liang appealed to the Presbyterian Mission for help. She sneaked away from the brothel and was taken to the Mission Home. There she remained, learning a new religion and a new language. 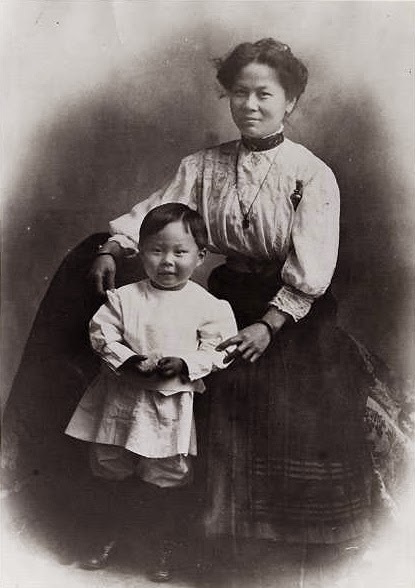 In 1892, Minneapolis businessman Woo Yee Sing came to the mission looking for a wife. He chose Liang and together they returned to Minnesota. Liang May Seen was the first Chinese woman in Minnesota. After 1900, more Chinese women arrived in Minneapolis. Liang was there, helping them learn English and adapt to their new home. This pioneering Minnesota woman died in 1946, a valued and respected member of her community.